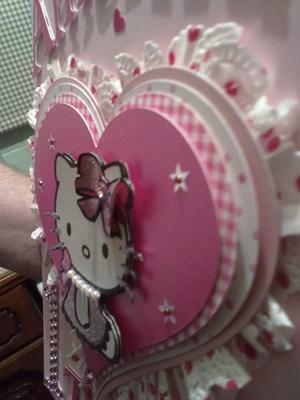 This was made with hello kitty wallpaper and paper doilies. I use some of the pretty wallpapers for backing paper or when using my spellbinders. The big DIY stores will let you have strips of wall paper for free, and the childrens wallpapers are great as you can cut out the main picture and layer it. This is an excellent tip for all frugal Crafters and there are some really pretty papers around that are ideal for the purpose. I bought a complete roll of paper with some small flowers on it and used it as backing paper and envelopes to match. It cost me all of 10p (ten pence) and I still have loads left to be used in the future. What a lovely little card, I especially like your idea of using wall paper.It just made me remember that I have a stash of it somewhere.lol A very good idea, and paper doilies are great too.